Razzel Dazzel is a Miniature Pinscher/Papillon mix who initially took on an unofficial role of therapy dog in 2003 when she was just 6 months old. She made her preferred vocation known at that time by comforting the elderly and helping two of her close friends through the ends of their lives. A few years after Razzel’s self-appointment, Meg decided to make it official and they became a registered therapy team with North Star Therapy Animals. 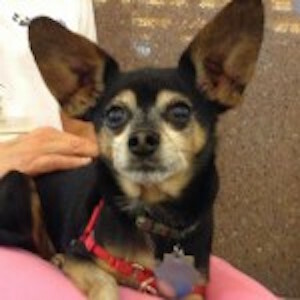 As Razzel embraces her own senior years, her favorite humans continue to be senior citizens. For the past 2 years her primary work has been in elder/hospice care. As a member of R.E.A.D. (Reading Education Assistance Dogs) and an invited guest, Razzel has dedicated her time at the Ronald McDonald House, numerous hospitals, nursing homes, and libraries. Together, Meg & Razzel also provide information on the important work therapy animals do for inquisitive visitors at locations like the Minnesota Landscape Arboretum and Linden Hills Woofstock. Meg is more than happy being at the end of the leash while Razzel draws people in to all 7 pounds of her loving frame. Today the Razz still feels that she is in charge…keeping a watchful eye on the elderly and having a playful romp with children when the opportunities arise. Over the years Meg & Razzel have reaped the benefits of creating countless happy faces and moments of joy. At the end of the day, it has always been a job well done.